SCAD (Social Change and Development) is an organization based in Southern India that works with the area’s rural poor. The organization provides villagers with opportunities to improve their education, health, and income, including through training programs in sustainable organic agriculture. One of SCAD’s agriculture programs, called the Soil Fertility Project, aims to increase the quality and fertility of soil using primarily agricultural and market waste. SCAD has become increasingly interested in biochar as the organization’s understanding of the potential benefits of biochar has increased. Much of the organization’s initial work with biochar has been through field observations conducted at SCAD’s 15-acre organic farm. The farm was developed three years ago on land previously covered in prosopis, an invasive bush that allows rain to leach the surface soil, leaving a semi-desert soil. 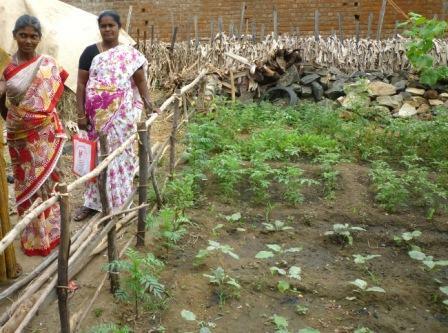 A team at SCAD has been carrying out additional tests in villages in order to enable women’s groups and farmers to see different approaches that might increase the yield of their crops through the use of biochar and other soil amendments. The team believes that farmers will adopt new practices only when improvements are demonstrated onsite. SCAD works in 500 villages, each of which has perhaps 50 small-scale farmers, so the potential for improving the structure of soil and the yield of crops is significant. The team, under SCAD’s directors, Dr Cletus and Amili Babu, is led by Mr Nagarajan and includes agricultural scientists and microbiologists, including Dr. Ravi Kumar (who invented the Anila cooking stove). David Friese-Greene and James Bruges worked with the group to identify appropriate production equipment and have been providing technical advice, as well. Funding for the project was provided by a private charity. SCAD has acquired a BiGchar 1000 fast rotary hearth pyrolysis unit from Black is Green Pty, Australia, and is using it to produce biochar. Recently, only prosopis has been used for the feedstock, but the team is now looking into agricultural waste from villages, as well as from coconut palm trees. Additionally, SCAD has installed an anaerobic digester which runs on green waste from the local college kitchens and local markets. This generates electricity for the pyrolyzer and bore wells and gas for cooking while also providing a nutrient-rich slurry to mix with the biochar. Overall, the tests consistently showed that the best results for root development and above-ground growth were with the use of biochar mixed with slurry and soil (BSS). The team found that most BSS samples showed a long root that was absent from other samples, possibly indicating its ability to access moisture at a greater depth during a drought. Sample pots with bhindi (okra) at SCAD were planted with the following preparations: S, BS, ES, BES, SS and BSS. BSS showed the best root development compared with others in the tests. The findings, as tabulated, were consistent with the maize field observations described below (click here for a table of results showing all the different soil preparations). Maize field plots at SCAD’s farm were established for the following ground combinations: S, BS, BES, BsludgeS, BSS and then plants were extracted from the center of each plot. 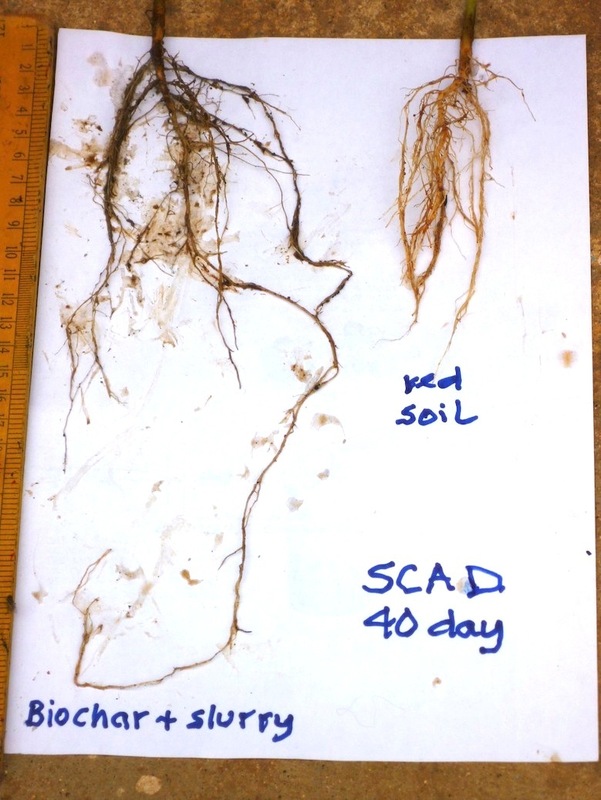 The BSS plot showed the best below-ground results: it had dense roots, hard main root shoots, and a long root. At the top of the root formation of the BSS plants were thick ‘shoots’ pointing downwards that would appear to be the start of new root development. Roots of BSS penetrated and held on to both ‘dust’ and chunks of char, indicating that the plants may prevent biochar being leached by rain. The large chunks suggest that much of the char is unavailable to other roots, so it would have been better for the char have been pulverized before introduction. Above ground, the BSS plants had the tallest leaves and leaves of a darker green than the other plots. 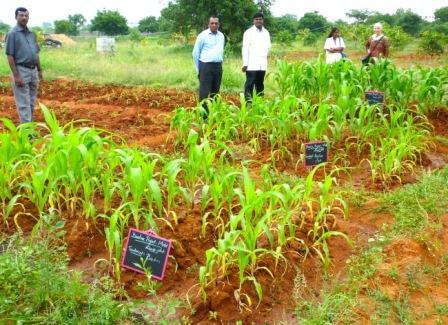 A village couple conducted a series of tomato observations laid out in their garden with 1.5m square plots with different applications of the soil amendment mixes. On the surface, the plots showed little obvious difference, but when plants were lifted their root structures varied significantly. Again the BSS showed best results, and those plants were the only ones to have a long root. The couple also used the mixtures on a number of banana plants and noted the greatest benefits for those planted with a biochar mixture. The monsoon failed this year, requiring plants to depend on irrigation more than rain. The SCAD team reported that areas where biochar had been used in their fields suffered less than other areas. They believe this is due to the ability of the biochar to retain moisture. When it did rain, there were heavy downpours, and the char was held in place by the root penetration. 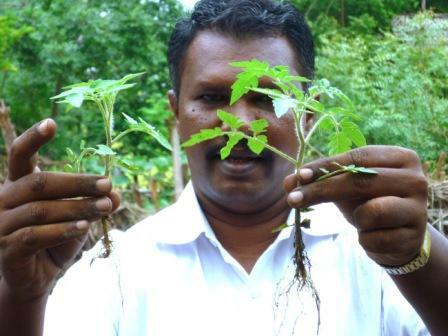 Mr Nagarajan says he is impressed with the observations and intelligence of the farmers doing the biochar trials. They are cautious and will not adopt new practices simply because they are urged to do so; they need to start at a small scale to see the results for themselves. For this, the experience of women’s groups is of particular importance since they test small applications and observe them closely. As a result of the success of BSS applications, the demand by the farmers for biochar mixes now exceeds the amount available. SCAD’s policy is to give a first allowance to farmers as a test case free-of-charge. The next season, 25% of the cost is charged; the following season SCAD charges 50% of cost; then 75%; then the full cost. The project has found that farmers are willing to pay for the biochar-fertilizer mix based on the cost of production and distribution once the production equipment is in place. However, a subsidy of some type is necessary for the installation of equipment that produces biochar without emitting greenhouse gases and particulates. For more information on this work please see: www.scad.org.in and the Soil Fertility Project at: www.soilfertilityproject.com. The SCAD Team: Mr Nagarajan, the team leader, is third from left. ; all photos courtesy of James Bruges. Bhindi plants grown in soil (control) and BSS. Note the long root found with most BSS amendments. Maize field tests with BS in foreground. BES at center. BSS in the background. A plot in the Thalambu women’s group. Comparing BSS with S (control) on tomato plants.